We collaborated with illustrator Melissa Rachel Black and Portland-based Scout Books, to create a beautiful, environmentally-friendly notebook for all you dreamers and tiny housers out there. Why did we create these notebooks? Inspiration. 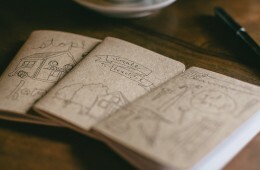 We love dreaming, and therefore we love notebooks and sketchbooks. In fact, Small is Beautiful was first conceived on notebooks in Airbnb . Read More.